The brightest X-ray sources in the Chandra X-ray image of the Cartwheel Galaxy are likely black holes, and appear as the white dots that lie along the rim of the X-ray image. The Cartwheel contains an unusually large number of these black hole X-ray sources, because many massive stars formed in the rim. 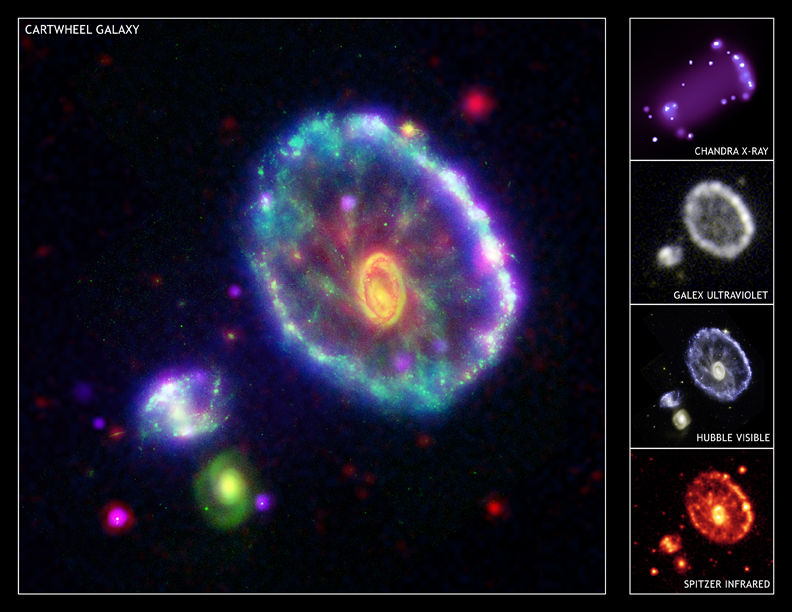 The Cartwheel Galaxy is one of the brightest ultraviolet energy sources in the local Universe. Recently-observed features include concentric rings rippling out from the impact area in a series of star formation waves, ending in the outermost ring. 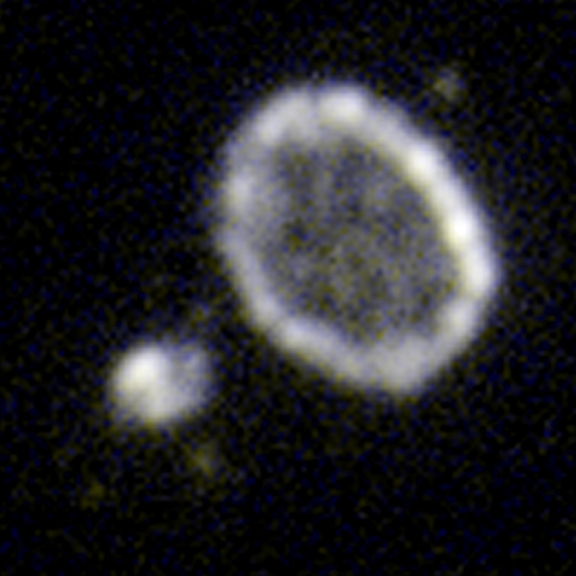 Previously, scientists believed the ring marked the outermost edge of the galaxy, but the latest Galaxy Evolution Explorer observations detect a faint disk, not visible in this image, that extends to twice the diameter of the ring. 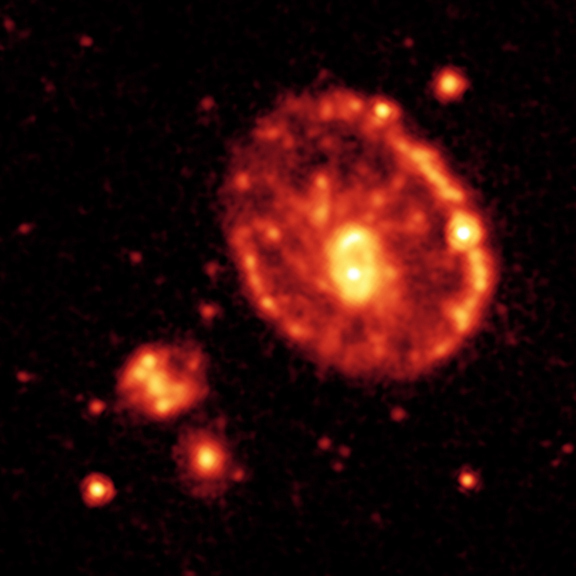 This image of the Cartwheel Galaxy was taken by the Spitzer Space Telescope in 8 micron infrared. 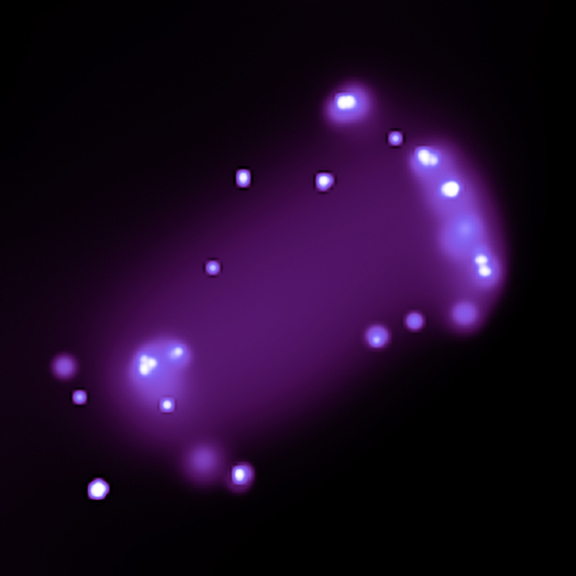 The Cartwheel is part of a group of galaxies about 400 million light years away in the constellation Sculptor. This image of the Cartwheel Galaxy was taken by the Hubble Space Telescope in blue band visible light. The Cartwheel is part of a group of galaxies about 400 million light years away in the constellation Sculptor. This image combines data from four different observatories: the Chandra X-ray Observatory (purple); the Galaxy Evolution Explorer satellite (ultraviolet/blue); the Hubble Space Telescope (visible/green); the Spitzer Space Telescope (infrared/red). The unique shape of the Cartwheel Galaxy with its huge rim - larger than the diameter of the Milky Way galaxy - is likely due to a collision with one of the smaller galaxies on the lower left several hundred million years ago. The insets to the right of the composite show how each telescope individually views the Cartwheel. The colors represented in these insets do not correspond with the colors in the larger composite. Hubble's view of the Cartwheel is colored green in the larger composite and GALEX's UV view is colored blue.